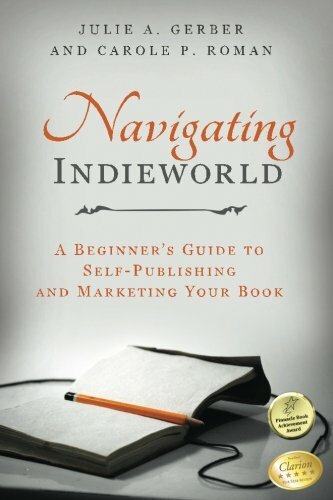 With so many guides geared toward Indie authors, I was curious to see what “Navigating Indieworld” by Julie A. Gerber and Carole P. Roman had to offer. Almost immediately, I noticed that the authors shared their experiences candidly, without limiting themselves. This is something not everyone does, as I discovered in all of the different workshops and conferences I have attended since my humble beginnings in the 90’s. “Navigating Indieworld” has 33 short and to the point chapters. Each one shares an experience and its title states who is sharing. The information presented in the book is basically organized chronologically - from the beginning of the Indie process (writing and publishing), to marketing and publicity. The authors not only share what worked for them, they also share the costs and give real life examples and websites to check out for promoting purposes. At the end, they complemented their guide with a directory by topic, which lists the organizations, reviewers, blogs, and publications mentioned within the book. Julie and Carole are definitely a dynamic, no-nonsense, successful team. They share a wealth of priceless information, useful especially to new Indies, but also helpful to more experienced ones. Their tone is clear and to the point. Their voices come through like a friend speaking to you. The information shared is well presented and it flows in a logical easy to follow format. I actually wish this book had been published when I first started. It would have saved me a lot of headaches and tough learning lessons! Overall, “Navigating Indieworld” by Julie A. Gerber and Carole P. Roman is a five-star ‘Must Have’ self-publishing guide for all authors who venture within the Indie world. Note I said, must have, and not must read, as I believe it to be a book that should be read more than once as the ultimate Indie publishing/marketing map. I will be keeping this one!